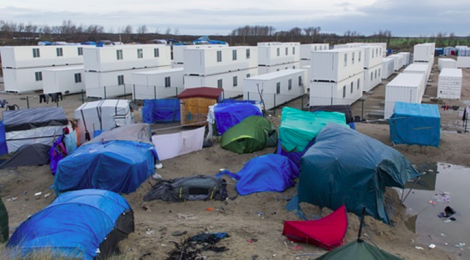 The past twenty-four hours have been a tense time in the Jungle – the refugee camp outside Calais. The state authorities have been wanting to bring in housing containers that would shelter 12 people each, however there is only enough containers to provide shelter for 1,500 when the camp currently contains 5-6000 people. The camp also contains stable communities and support networks. From out of nothing there are shops and cafes made out of wood, pallets and tarps. A library, school, churches and mosques have all been built to provide small comfort in amongst the squalid conditions. The various communities involved have established centres to help new arrivals and support those who have been staying for some time. The conditions in the camp are dire, with everyone wanting a safe and dry place to live. However the containers are being forced on the camp at the cost of bulldozing the existing infrastructure and leaving most people out to die. Along with this any new camp would be surrounded by prison-fencing and those inside subject to a harsh registration regime. Make no mistake, this is the creation of a new concentration camp in the heart of Northern Europe. It comes at no surprise that the residents of the Jungle have opted to resist these changes. Evictions have started, tear gas is being used on the residents, and a call out for on-the-ground solidarity has been made. If you can get over then now is the time to do so.